This poster by Dutch artist Reijn Dirksen was designed to advertise the ERP. 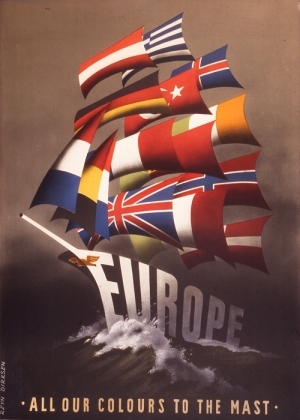 The European Recovery Program (ERP) was a US-sponsored program designed to rehabilitate the economies of 17 western and southern European countries after World War II. The program was also known as the Marshall Plan, after Secretary of State George C. Marshall, who presented the plan at Harvard University on June 5, 1947. Congress authorized the establishment of the European Recovery Program, which was signed into law by President Harry S. Truman on April 3, 1948. The 13 billion dollar program ran for four years and included financial and material help, such as credit, raw materials, groceries and other goods for the countries that had joined the Organization of European Economic Cooperation (OEEC). Aid was initially offered to almost all European countries, but the Soviet Union withdrew from the program and was soon followed by the other Eastern European countries under its influence. Bundeszentrale für Politische Bildung (Germany). Selling democracy die Filme des Marshallplans. Bonn: BpB in cooperation with Bundesarchiv-Filmarchiv, Deutsches Historisches Museum, and Internationale, 2006. Djelic, Marie-Laure. Exporting the American Model: The Post-War Transformation of European Business. Oxford [England]: Oxford University Press, 1998. Kipping, Matthias, and Ove Bjarnar. The Americanisation of European Business The Marshall Plan and the Transfer of US Management Models. London: Routledge, 1998. Maier, Charles S., and Günter Bischof. The Marshall Plan and Germany: West German Development Within the Framework of the European Recovery Program. New York: Berg, 1991. National Archives. "The Cold War and the Marshall Plan", http://www.archives.gov/research/alic/reference/military/cold-war-and-marshall-plan.html. National Archives. "Featured Documents: The Marshall Plan", http://www.archives.gov/exhibits/featured_documents/marshall_plan/index.html. Bundesarchiv Koblenz, Germany. Records of the Bundesministerium für den Marshallplan/ Federal Ministry of the Marshall Plan. George C. Marshall Foundation Museum/ Research Library, George C. Marshall Papers.